(CNN) – Rush Limbaugh brought his popular vitriol to national television Sunday, calling President Barack Obama unqualified and questioning if Obama and other Democrats care about the nation’s well-being. In a rare television interview, on the FOX News Sunday program, the conservative talk radio superstar declared himself worried about America’s future under Obama and said he wondered if the president and the Democratic Party wanted to hurt – rather than help – the country. 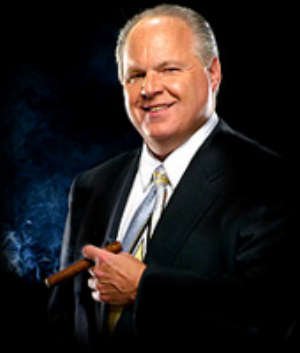 "We’ve never seen this kind of radical leadership at such a high level of power in the in the country," Limbaugh said. "I believe that the economy is under siege, is being destroyed. Anybody with any economic literacy would not do one thing this administration’s done to try to revitalize the private sector. They’re destroying it. "… And I have to think that it may be on purpose, because this is just outrageous, what is happening – a denial of liberty, an attack on freedom." In other comments, Limbaugh called Obama "immature," "a child," "narcissistic" and "over his head." He called Obama’s pre-dawn trip to Dover Air Force Base last week to view the dignified transfer of war dead from Afghanistan a photo op. Asked to respond, Obama’s senior adviser, David Axelrod, called Limbaugh an entertainer. "I think it’s a surreal day when you’re getting lessons in humility from Rush Limbaugh," Axelrod said on the CBS program "Face the Nation." "We’ll let Mr. Limbaugh fulminate. I think the American people are well served and believe they’re well served." Also Sunday, independent Senator Joe Lieberman of Connecticut said on the same program that he rejected Limbaugh’s characterization of Obama’s trip to view the return of war dead. "I just totally disagree with him," Lieberman said of Limbaugh, adding: "I was proud that my president was there." For his part, Limbaugh attacked every policy, action and motivation of the Obama administration. He said the third quarter economic growth reported this week was all due to government intervention – from the Cash for Clunkers program and homebuyers’ tax credit – rather than actual private sector expansion. Obama was delaying a decision on more troops for Afghanistan for political reasons, Limbaugh said, and health care reform is a thinly disguised Democratic attempt to gain government control of one-sixth of the economy, he said. He derided Democrats on security issues, saying they cared more about their political well-being than protecting the country. "I hate to be honest with you here, but I do question their commitment to national security," Limbaugh said. "I question their commitment to the US military. They’ll put their political survival and their political power being gained over anything else. They’ll use anybody and throw anybody away in order to achieve it." His comments Sunday included a personal glimpse, with Limbaugh saying his treatment from drug addiction helped him deal with feelings of personal inadequacy. At the same time, Limbaugh confirmed his latest contract could earn him $400 million, and he claimed credit for launching conservative talk radio and the eventual existence of a wide range of right-leaning media outlets.